The buzz on these peanut butter cookies? 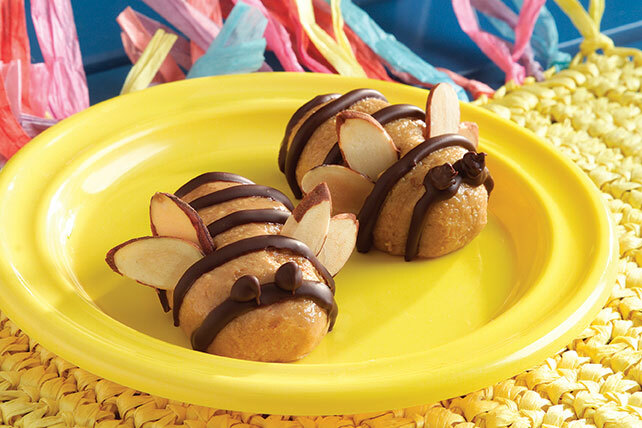 They simply fly off the dessert table—thanks to their chocolate stripes and sliced almond wings. Beat butter, peanut butter and powdered sugar in large bowl with electric mixer on medium speed until well blended. Add cracker crumbs; mix well. Shape tablespoonful of butter mixture into 1-inch oval to resemble body of bumble bee. Repeat with remaining butter mixture for additional "bees." Melt chocolate as directed on package. Drizzle in lines on top of bees to resemble bees' stripes. Insert almonds into both sides of each body for "wings." Store in refrigerator up to 3 days.